I've been reading too much about sound deadening materials and I now need some advice. Prices are all over the place for this material but I don't want to break the bank. 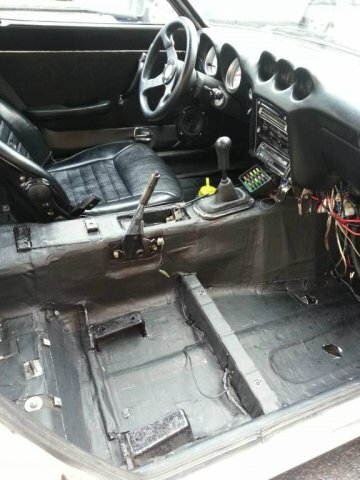 My 240 floors are stripped, repaired and painted with POR 15 and are ready to be covered with sound/heat deadening material. I'm not dealing with a big audio system, just trying to keep the noise and heat at bay. Any recommendations from someone who has purchased and installed this type of material recently? I did a bit of searching and a friend offered to pickup one off of summit to push his order over the free shipping. I got the thermo-tec cool it mat. One pack was enough to do the trans tunnel and the fire wall. Pretty easy to install. Just get a knife with a disposable blade and a good concrete floor. There wasn't any smell associated with it and it dropped my in cabin temps about 40*F on hot days (on 90*F days my car would be 110*F inside, after it would be about 70*F). I think you would need two if you wanted to do like the door panels and the trunk area. I just did my whole car with it and seems to be identical to Dyna mat but a lot less expensive. ^Thanks for that. Some sound and thermal insulation is one of the additions I plan to make this Summer. I've used Dynamat extreme for a few work projects that held up really well and was easy to work with. For my car though I'm going to use the lizard skin products; it's supposed to work very well and is really light weight. jpndave on here has some lizard skin in a jeep he built that seems to work very well for noise and heat control. +1 for Dynamat. I used this on my previous race car and it made a HUGE difference. How heavy is the X-Mat? I'm hoping to not add too much weight. Each mat is about 3 lbs and I needed 17 mats to cover everything. After all the research i have done about sound deadening and user reviews on all the "Off brand" types, dynamat is the most expensive for a reason. Most reviews seem to say to some effect, "Should of just spent the extra money on dynamat to begin with and save myself time and the hassle". I have dynamat in my car, made a very noticeable difference as soon as a drove it. Remember, you do not have to cover every square inch of your car in it, it just reduces the resonance the metal makes by reducing vibrations. Eastwoods X Mat, doesn't smell, doesn't peel off on hot days, at least if you applied it properly, less than a 1/3 of the price. I used a product called Second Skin Damplifier, which is very similar to Dynamat. Specs pretty much match. I chose it over Dynamat because the back is unbranded and a flat dark grey color - nothing shiny to poke out front behind the floor mats. It's not cheap, but the quality was excellent and it works very well. I went to town with it when I installed it four years back, and it still works great, zero issues or regrets. 60 sqft should be plenty, by the way. I think I added about 20-30 lbs to my car using it, but it was worth it for the everyday comfort and the added 'solidness' feeling of the car. Besides, the tar crap it replaced probably weighed about 10lbs anyway. Lizard skin sells a spray on insulator they sell one for sound and one for heat and can be sanded and painted to match the body if you like. I used the lizard skin sound and heat, blocks a ton of heat, and is very light. You also get 100% coverage because you spray it on. Did my whole car inside and out 2 coats. After taping and foiling it up takes about 15- 20 min to do a coat. I did the whole bottom side of the car on the outside, and the whole inside of the car. It quieted it up a lot too. Make sure you apply them in the correct order. I used fatmat on my last car, some peel and stick crap. That was a huge PITA to install, you can't put it on the outside, and it's hard to cover weird shapes without overlapping, plus if like the factory stuff, if it gets an air bubble in it and moisture gets in, it will never come out and rust the car from under the mat. I am considering using the Eastwood sound and heat. Anyone have any direct experience? 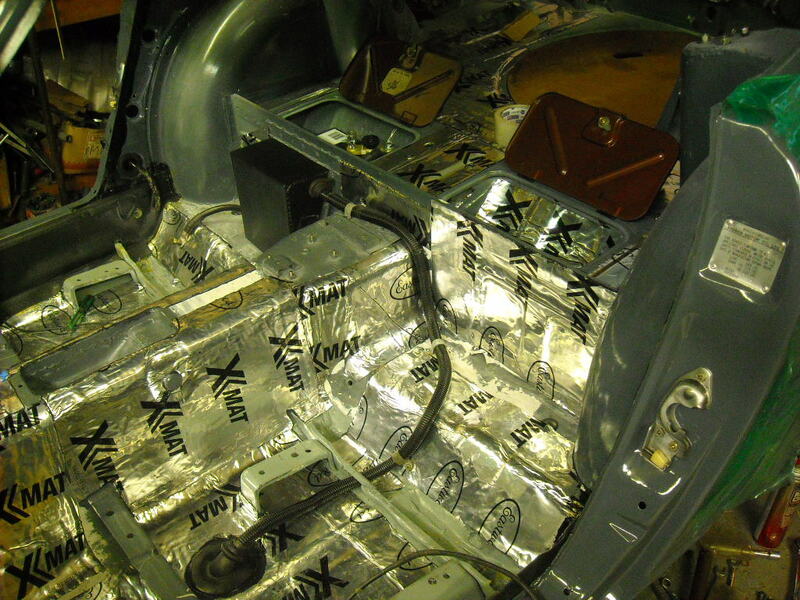 Sound deadening is a complex problem. To simplify, it is often covered in two broad areas. High frequency and low frequency. The tar like mats, who ever makes them, are heavy for a reason, are stuck directly to bare steel panels and damp high frequencies. Adding mass lowers the reasonant frequency of the material. Your door when struck goes from tinny (hi freq) to a thud or thunk (low frequency). The volume of the total noise getting through the panel is reduced some what but not usually enough. You have lowered the frequency of the sound that gets through, but how do you reduce the magnitude of that noise? I use the b-quiet product. b-quiet.com. They publish their attenuation specs and comparisons. Price is right too. No smell, good adhesion, good performance. Heat attenuation is whole 'nother ball of wax. Doing something reflective around the exhaust on the OUTSIDE is your best level 1 defence. 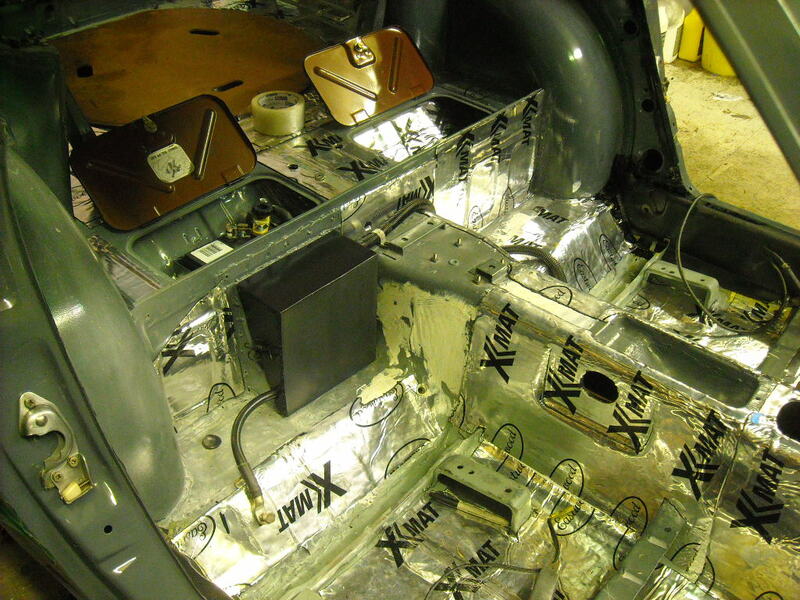 The sound deadening products you're applying have a variety of R-Values and effectiveness. Anyone have an experience with Dynadeck? It looks good from the website but everything does. I want something I can put in place of the carpet because I don't want any. Bare metal is too exposed but a minor floor covering with some heat dampening properties would be great. I'm glad to hear of your positive first hand experiences with the lizard skin products as I have both sound deaden-er and heat suppression waiting to be applied when that time comes in the build. I'm using a Noico product, and am reasonably happy with it. Good adhesion (even on the roof) and good sound damping qualities. Priced much better than some of the other products, and it's available in black. Also you can get carpet with mass backing to help even more. I think the place was called auto interiors? that sells it. They are in Alabama. They have a sound deadener built on the back of the carpet. Is there any noticable glue/rubbery smell from it? That Noico stuff is definitely the cheapest by far, I'm just wondering what the drawbacks are. Nope, no smell (even when brand new in the box). Haven't found any drawbacks to it yet, and I've had it in the car roughly 6 months.